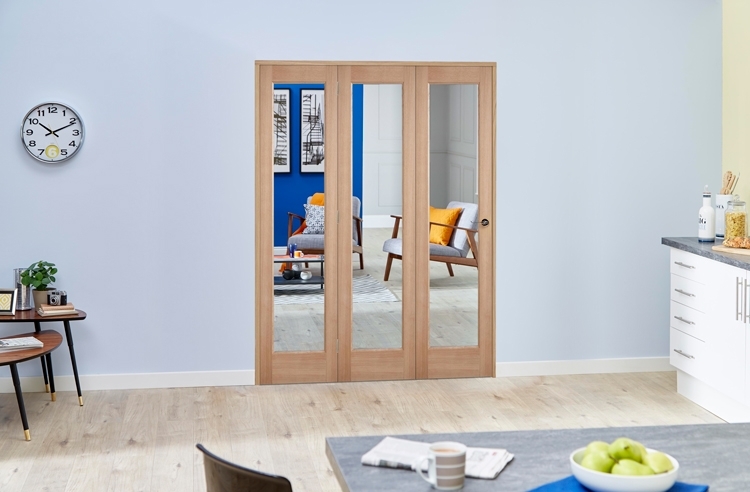 The Climadoor Oak Roomfold Deluxe internal bifold doors system is offered complete with base track, low-level threshold (for great rigidity), guides and drop bolts. This top hung, clear glazed, unfinished oak door leaf design has lead the way in internal folding bifold door systems. This oak roomfold Deluxe internal bifold system is available in 3, 4, 5, and 6 door systems, using unfinished Glazed oak internal doors giving you a wide range of door sizes and patterns to choose from.To decide on the best solution of which bi folding doors are for you, take the time to review the opening sizes and product sizes available before selecting the option to buy. All Slimline door options have narrower 60mm door stiles to maximise glass area. All standard doors have 110mm stiles. This set consists of Frame pack, doors, hinges, running gear, head and base track / threshold and drop bolts and is provided in an easy to assemble kit form. Joiner recommended. Please refer to our storage and decorating recommendations before installing the doors. All doors MUST be decorated before installation. All our Roomfold Deluxe systems are offered without handles and latch to allow you to match existing handles in your room.